The Maison de la littérature (House of Literature) is located in the historic neighbourhood of Old Québec, a site part of UNESCO’s World Heritage List. 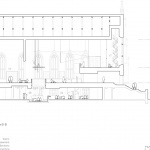 In this particularly dense urban setting, Chevalier Morales designed a contemporary annex, a simple and refined volume, to the Wesley Temple, a neo-Gothic heritage church. Since its opening, the Maison de la littérature has rapidly become a vibrant home to Québec literature and a popular touristic destination in Old Québec. 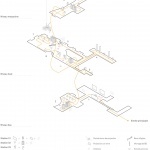 Stemming from an architecture competition, the winning project by Chevalier Morales proposed an unforeseen solution, a response exceeding the initial commission’s expectations. The architects chose to move part of the program into a new annex outside the church space to provide a more transparent and universal entrance.This strategy also helped declutter Wesley Temple, allowing the architects to preserve and restore the original spatiality of the overall structure. Along with the library spaces, the Maison de la littérature’s unique and innovative program also includes a concert/lecture hall, a café, a temporary exhibition space, a permanent exhibition, a resident writer’s apartment, creation studios, a projection room, a classroom as well as a multimedia studio. The Wesley Temple, built in 1848, was closed in 1931 and was transformed in 1944 into a public library and a concert and lecture hall for the Institut Canadien. The latter was closed to the public in 1999. 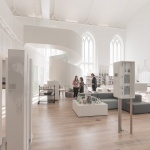 The new Maison de la littérature offered to the Institut the opportunity to pursue its mission, while remaining one of the oldest public libraries in the province of Québec. 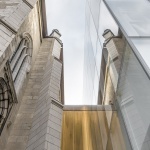 The partly transparent and strangely familiar shape of this new annex gives an open, contemporary feel to the Institut Canadien de Québec, the main entrance of which is now accessed naturally from the bottom of the sloping Chaussée des Écossais where it intersects with Rue St-Stanislas. 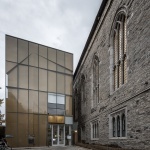 The outer shell of the façade is made of glass panels with an underlayer of perforated brass sheets, which compose an intriguing bas-relief. 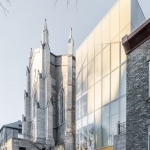 Furthermore, the glass annex reflects its surroundings, integrating itself carefully, without mimicry, into the historic urban context of Old Québec. 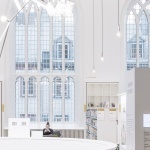 This extension, which in its dialectic relationship with the original temple brings the institution fully into the 21st century with its e-books and Twitter poems, houses the main creative spaces in the upper levels. All the necessary mechanical spaces are also found in the basement of the new addition. 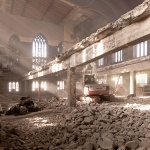 The idea of putting the creative spaces outside the temple while maintaining a close connection to it seemed symbolically appropriate. Slightly detached, the annex’s impressive views of the river and the old city offer a greater sense of freedom. 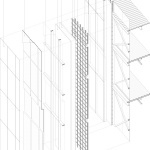 The insertion approach used for the new annex is aimed primarily at showcasing, complementing and preserving the heritage value of the existing building. 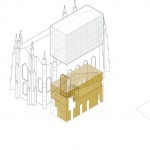 The extension emerges as a strong symbol of the redeveloped heritage space and avoids altering the architectural composition of the existing structure. The project also included a significant restoration component for the building’s masonry and English gothic church windows. 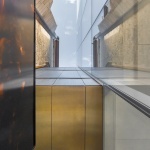 The glass annex, with its high-quality materials, its transparency, and its detail simplicity, establishes a material and formal dialogue with the existing stone building. 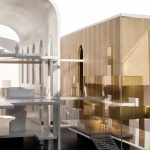 The extension’s simple and controlled skin does not compete with the richness and quality of the adjacent historic details and masonry assembly. 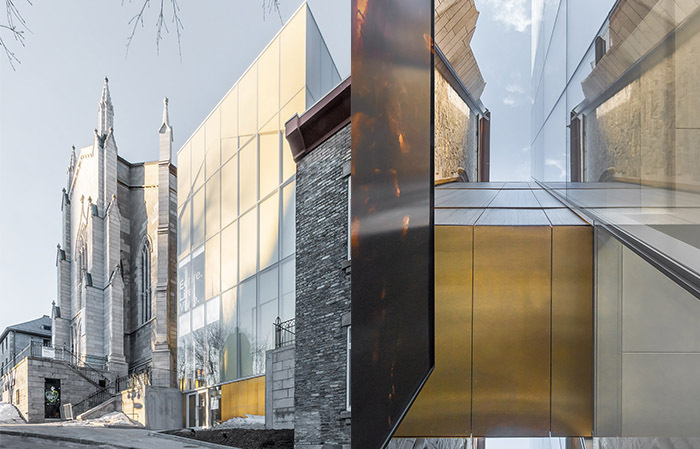 The Maison de la littérature creates a dialogue between the past and present of the historic neighbourhood of Old Quebec City. 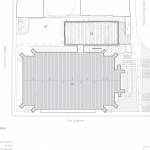 The institution’s interior layout provides greater access via the main door of the temple as well as the parking lot that also leads into the annex. 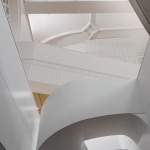 These various access options all converge on the large circular opening in the library’s floor and the hanging contemporary light fixture at the heart of the building, vertically connecting the café, two exhibition areas, and the library collections. 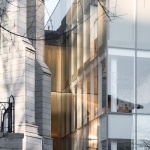 Through the original solution of the annex, it was possible to restore the Salle de l’Institut, a cultural and intellectual hotspot in Québec City for the second half of the 20th century. 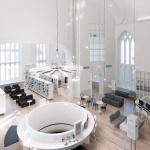 Above, the almost completely white library is filled with light. 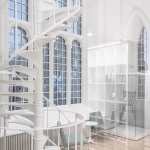 Accessible through a sculptural white spiral staircase, it embraces the generous spatiality of the original church, including carefully restored elements from previous transformations that highlight the place’s rich social and spatial history. Preserved original features like the ogive windows and the ceiling’s moldings blend harmoniously with the contemporary furniture. A permanent exhibition on the theme of freedom in Québec literature had to cover the whole temple area, rather than being confined to a single room. 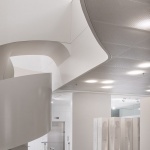 The architects carefully conceived and integrated this immersive exhibition promenade with a variety of other programmatic uses on the three levels of the Maison de la littérature. With its circular shape and multiple levels, the new concert and lecture hall can be isolated through concentric and sliding acoustic panels integrated to the ceiling. 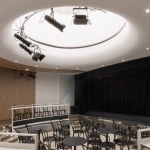 The space is technically equipped to host conferences, plays, intimate concerts, and public presentations.